You can never know in advance all the news that will move the market in a given week, but some things you can see coming. From the year's most important consumer tech exposition to a struggling casual dining chain reporting quarterly results, here are some of the things that will help shape the week ahead on Wall Street. Monday -- Steaks on Skates: When it comes to fast food with throwback charm it's hard to beat the retro ways of Sonic (SONC). There are more than 3,500 "drive-in" locations where guests can pull up to a parking stall and order burgers, shakes, and taters from intercoms. Things haven't been easy for the fast food industry. An improving economy is sending customers to the higher quality fare at fast casual concepts, which combine fresher food with quick service. Sonic has held up better than its more traditional burger-flipping rivals, posting same-restaurant sales growth of nearly 6 percent in its most recent quarter. It will provide financial results for its latest quarter on Monday. Tuesday -- Check In with the Tech Insiders: Consumer tech has never been hotter as consumers snap up smartphones and tablets. 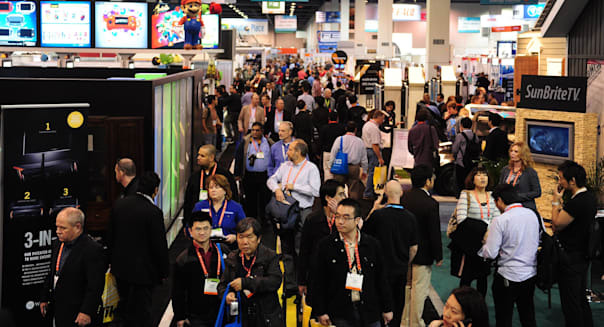 CES -- the annual consumer tech powwow -- kicks off on Tuesday for four days of companies showing off their latest gadgets. Wearable computing will naturally be a big part of the event, and we'll see on Tuesday how many companies will be aiming for this market with high-tech bracelets, shoes, glasses, and other accessories. %VIRTUAL-article-sponsoredlinks%Wednesday -- Ruby Tuesday in the Red: It's not just fast food that's feeling the pain these days. Many of the more ordinary casual dining chains are also struggling to woo the hungry. Ruby Tuesday (RT) is no different. The stock hit new lows three months ago after posting disastrous quarterly results. Comps are plunging, profits have turned to losses, and Ruby Tuesday has missed Wall Street's expectations in back-to-back quarters. Ruby Tuesday's trying. Its latest strategy has been to offer pretzel bread burgers and flatbread pizzas at single digit price points. We'll find out if the new menu items are helping when the chain reports on Wednesday. Thursday -- Bucking the Trend: It seems as if saving money never goes out of style, but not every discounter is thriving in this environment. Family Dollar (FDO) is merely holding up, and that's not necessarily a bad thing. Analysts see Family Dollar matching last year's quarterly profit of $0.69 a share when it reports on Thursday. They see sales climbing 4 percent for the period. With so many other dollar stores and deep discounters smarting, even nominal improvement is worth applauding. Friday -- Hero We Go Again: The Hercules story's been told and retold on the big screen, and now it's Lionsgate's (LGF) turn. "The Legacy of Hercules" hits theaters on Friday, and the live-action movie will screen on 3-D theaters as well as traditional 2-D projections. January usually isn't a big month for releases. Studios try to present their likely crowd-pleasers closer to the holidays, and they try to release award-worthy films by the end of December to qualify for Oscar consideration. However, folks do continue to hit their local multiplexes in January, and this could be a big attraction for those seeking an action flick on a cool evening.